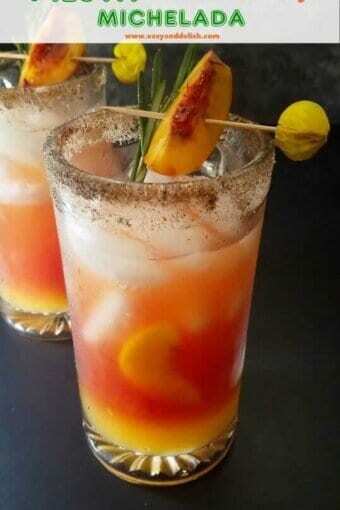 An easy, quick, and super refreshing Peach Rosemary Michelada made from beer, peach and tomato juices, sugar, and ice. The perfect cocktail for Cinco de Mayo! As a resident of the great state of Texas, and having several Mexican-American friends, I started celebrating the day a few years ago. In my city, San Antonio, Cinco de Mayo is a big deal. 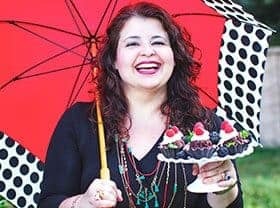 There is a rodeo, a big downtown parade, music featuring country, Tejano, and other rhythms, and many other extraordinary entertainers. Schools and libraries celebrate the day in educational ways. Restaurants are packed– especially the ones on the River Walk. Bars and clubs host major parties, serving all kind of drinks, especially micheladas. I could say that micheladas are the official drink of Cinco de Mayo! Our own Peach Rosemary Michelada is something to watch for. 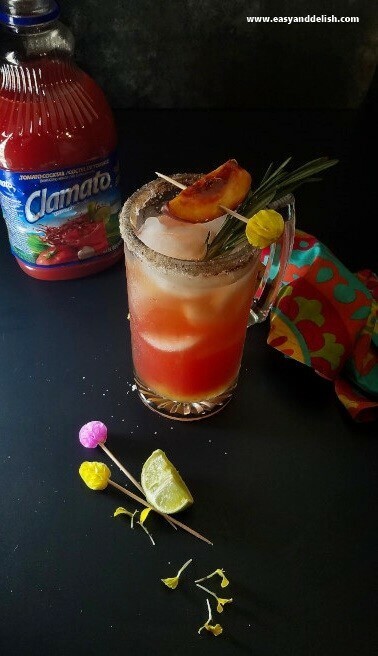 It is easily made with light beer, peach juice, Clamato® Tomato Cocktail, lime, sugar, and ice. As an option, you can sprinkle in a bit of chili powder or add a few drops of hot sauce.All we have to do is mix all the ingredients together in a large glass beer mug and enjoy. Awesome, right? 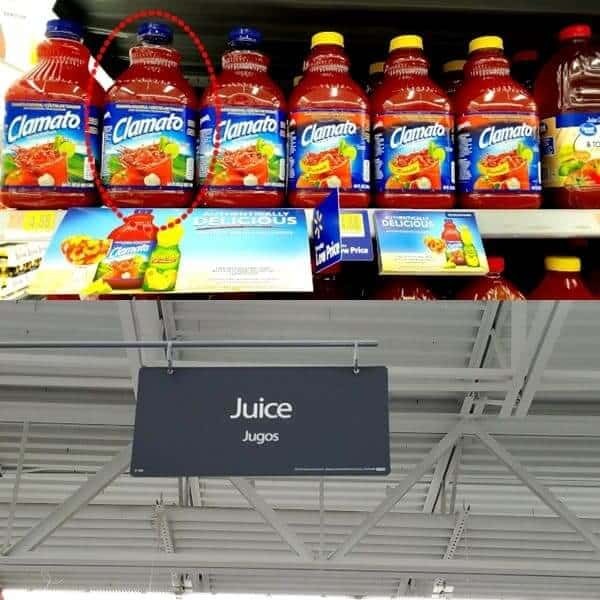 Another great thing is the convenience of finding Clamato Tomato Cocktail in Walmart‘s juice aisle… as well the other ingredients, all in the same supermarket. Clamato® Tomato Juice Cocktail Original is a tomato cocktail that comes in various sizes — including the 64 fl. oz size. It adds more to your meals and cocktails – just like the perfect Michelada– and also really spices up parties and get-togethers with family and friends! We are serving our Peach Rosemary Michelada with grilled peaches wrapped in jamón and drizzled with a bit of honey — which pairs perfectly with our drink. Jamón is dry-cured ham similar to prosciutto. 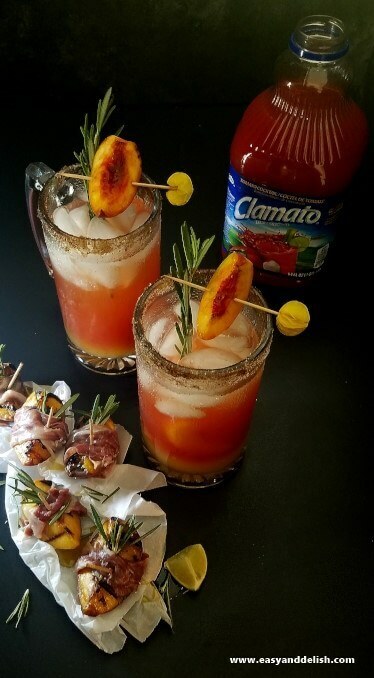 I am telling ya, these sweet/tangy/spicy Peach Rosemary Micheladas will have you cheering for Cinco de Mayo along with your loved ones and friends… and having lots of fun! 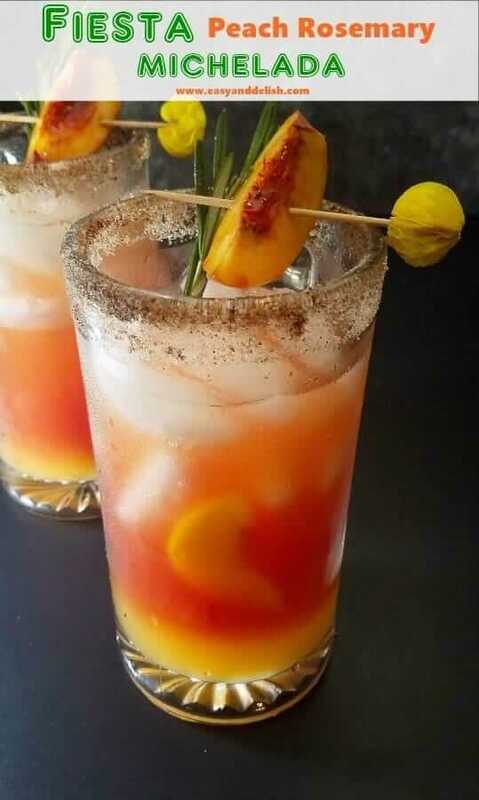 An easy, quick, and refreshing Peach Rosemary Michelada made from beer, both peach and tomato juices, sugar, and ice. 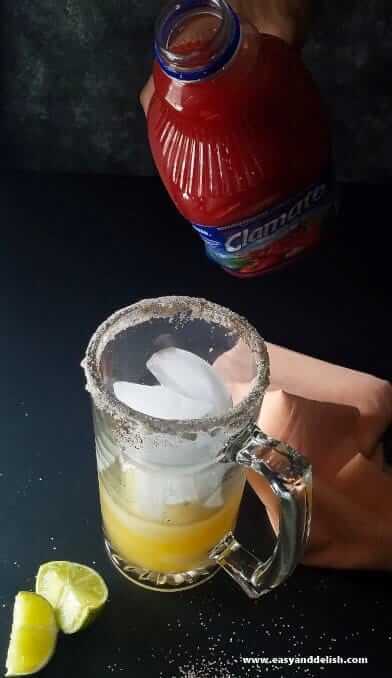 The perfect cocktail for Cinco de Mayo! Run quartered lime across the rim of each mug. In a deep plate, combine 1 cup of sugar with 1-2 Tablespoons chili powder. Dip mugs one at a time in the mixture to coat rims evenly. 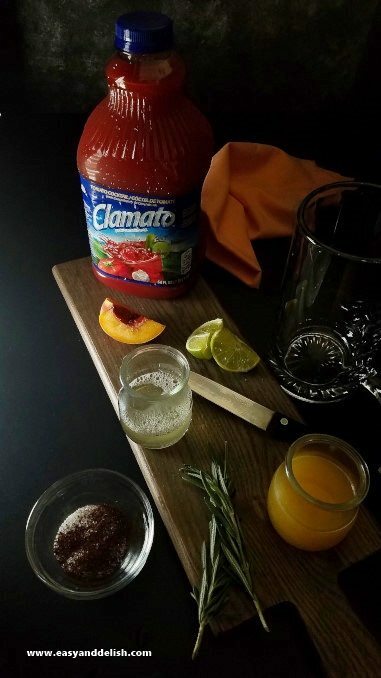 Add ice cubes and then, combine 8 oz beer, 6 oz Clamato, 3 oz peach juice, juice of half a lime, and 2-3 Tablespoons sugar PER MUG. Stir in a pinch of chili powder if desired. Garnish each mug with a quartered peach and a sprig of rosemary. Enjoy! Our Peach Rosemary Michelada can be served with grilled peach and jamon skewers drizzled with a bit of honey -- or any other appetizer of your choice. Jamon is dry-cured ham similar to prosciutto. I’ve been spending my days in the garden. This is a perfect drink for the end of the day. Peach and rosemary are such inviting flavors! Definitely chili powder or hot sauce for me! This looks terrific — nice and refreshing and just loaded with flavor. Thanks! And I was wondering what if I replace beer by wine or tequila or gin I guess I’m gonna try it soonnn! I think the alcohol replacement would work great. The adding of chili powder would work best with tequila for sure!